Free Narcan. REVIVE and SAVE a LIFE. Ask about our FREE Narcan program. Find out why everyone should have this in your first aid kit. Kids Free Monthly Vitamin Program. No purchase necessary. All children ages 2-12 welcome. Don’t wait, stop by today! compounding services, enabling us to make personalized medications. Whether you need hormone replacement therapy, have a pet with specialized medication needs, or have allergies to certain medications, we can create a custom compounded solution to your specific needs. 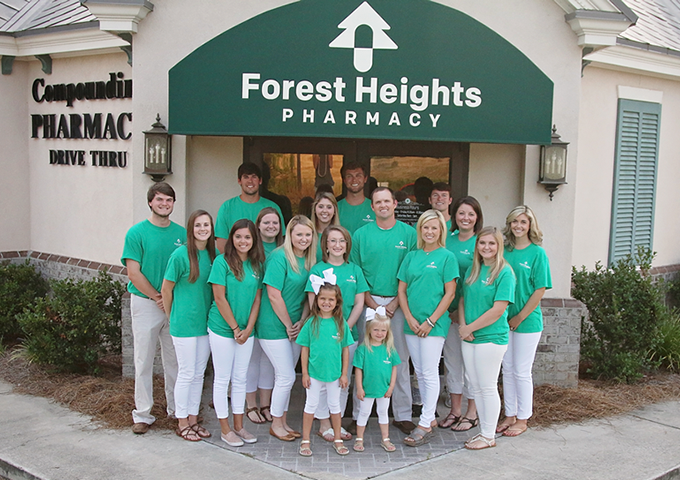 Forest Heights Pharmacy offers a variety of popular immunizations. From the flu shot to the shingles vaccine, we are here to help. Our pharmacists are certified in vaccination administration. Come see us and avoid having to go to the doctors office. Simply call ahead for an immunization appointment, or stop by today for a walk-in flu shot. Our pharmacy offers fast, friendly, and reliable service, a convenient drive-thru window, and free prescription delivery service. Save on compounding services, and a prescription and health review to ensure you are getting the best price and medication therapy for your needs. We accept most insurance plans, including Medicare, Medicaid, and private insurance. In addition to your favorite local pharmacy, we are a one-stop shop for all of your specialty shopping and gifting needs. Our boutique offers locally made products and gifts for every occasion, monogramming and other unique items. Stop by today and see for yourself the many unique items gifts and locally produced products we have to offer in our gift shop. We strive to meet each customer’s individual needs, giving you the health care you deserve. We offer innovative cost saving full compounding services, Biodentical Hormone Replacement, ED drugs, and pet medications plus a prescription and health review to ensure you are getting the best price and medication therapy for your needs. Save money, and receive better results. Come by Forest Heights today, and let us help you save money on a prescription that is made just for you.